With EastComfort Romania, there is an apartment for everyone. Here are displayed more than 50 quality apartments for short term in Bucharest. 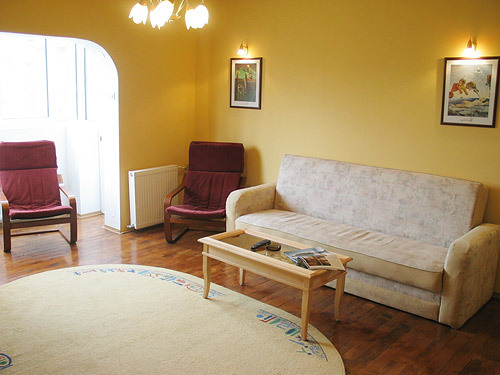 Find a Bucharest apartment in Romania. This cosy Bucharest apartment comes equipped with all the confort. Different from others apartments, the open-plan living area of this apartment has hard wooden floor. The apartment is furnished with a fold-out sofa bed, armchairs and bookcase. Both sunny bedrooms have full sized beds, wardrobes and night stands. American style, spacious and fitted kitchen fulfils any self-catering needs. The bathroom draws a modern look with bathtub and shower fixture. The flat is well-protected, the alarm system being connected directly with the best guard company which will arrive in less than 5 minutes. It is the proper choice for those who seek privacy at a fair price in Bucharest. The apartament is at 50 m walking distance from the Bucharest Mall (70 stores, over 25 restaurants and cafes, the 10-screen Hollywood Multiplex Bucharest Mall cinema), while 400 meters away, in Alba Iulia Square, you can have dinner at Zvon Restaurant (2 saloons and International Cuisine).